North Korean leader Kim Jong-un has disappeared from public view again amid a stalemate in denuclearization talks with the U.S. and just as senior South Korean officials prepare to visit the North. State media have been silent about Kim's activities since Aug. 20, when he attended the funeral of former People's Armed Forces Minister Kim Yong-chun. Until then he had conducted a flurry of very public activities, giving on-the-spot guidance, as it is called, at factories and farms all through the provinces. That makes it feel as if he has gone into hiding as the international community tightens the screws again, though he may simply be taking a break. Five senior officials led by national security adviser Chung Eui-yong are to go to Pyongyang on a flying visit Wednesday. 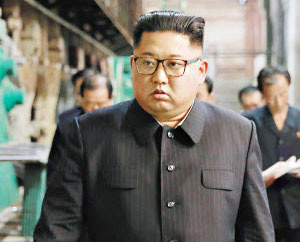 Cheong Wa Dae spokesman Kim Eui-kyeom said Monday, "At this moment we cannot say for sure that the officials will be able to meet with Kim."